This RAID controller card does not support RAID 5 or RAID 10. In fact it doesn't support any RAID configuration except for RAID 1 and RAID 0, that's it. It's a Plug-in card that's PCI Express x8 with 2 CH for PC and Unix. 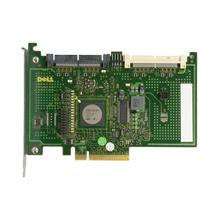 The Dell SAS6/iR integrated SAS controller card is designed to connect internal physical hard drives in workstations and servers. It's entry level and comes standard in the dell Poweredge r610 server. The SAS6/iR utilizes high performance SAS 3 Gbps technology to connect to the all the physical internal hard drives. It supports two internal x4 SAS connectors, each containing four ports for a total bandwidth of 12 Gbps, per connector. This card also supports for RAID levels 0 and 1 but not any RAID levels that are higher. It features integrated ARM I/O processor for processing all RAID 0 and RAID 1 operations. Up to 10 physical disks are supported by the integrated striping the SAS6/iR provides. The controller is incorporated with global hot spare feature, it can support a maximum of 2 global hot spares one for each virtual disk.